It’s that time of year again when I’ve made a list of a hundred things I’d like to accomplish before December 24th and I’m realizing I only have a few weeks to do it all. Who has time to cook dinner when there’s decorating, baking, and shopping to do? It’s times like this when my everyday healthy meals can be easily substituted for Thai take-out, pizza, and other high-calorie, unhealthy convenience foods. My solution: soup. When I’m feeling really stressed and don’t have time to devote to everyday healthy cooking I like to make a big pot of soup to get me through the week. I can reheat it for lunch when I’m at work and accompany it with a slice of bread or a salad for a few easy weeknight dinners. To coincide with my Lemon-Ginger Carrot Soup post today, I’ve also decided to launch “The Dark Side” with a related recipe. The Dark Side is a place where I can set calorie counting aside and explore the full gamut of my culinary passions. The guiding principle for The Dark Side is that “all work and no play makes Ava a dull girl.” The old proverb is as true for what we eat as it is for what we do: despite our best intentions to eat healthy all the time, sometimes we just have to throw caution to the wind and indulge. On The Dark Side I hope to share with you some of my favorite indulgences—many of which I wouldn’t otherwise post on avacatau.com. These recipes may push the calorie boundary, but will always hold true to my ideals for promoting sustainable and natural foods. 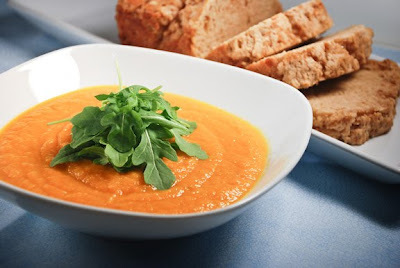 My Lemon-Ginger Carrot soup is very tangy and for ginger lovers only. On the Dark Side you’ll find the Honey Beer Bread that I served along side. It’s by no means low in calories, so for those of us watching our waistline, a small piece of this bread with a big bowl of soup makes a perfectly satisfying and healthy dinner. The recipe below makes a big batch of soup but can easily be halved. In a large stockpot combine the olive oil, carrots, celery, onion, and salt. Sauté over high heat, stirring frequently until the carrots begin to soften, approximately 10 minutes. Stir in the garlic, lemon zest, ginger, and black pepper. Continue to stir and sauté for an additional 5 minutes. Add the vegetable broth and simmer for 20 minutes. Using an emersion or traditional blender puree until smooth. Stir in 2 tablespoons of lemon juice and a little more black pepper and taste. It will probably need a bit more lemon juice and salt, adjust to your liking. Top each bowl with a small bunch of baby arugula leaves. Delicious served with my Honey Beer Bread. I couldn't help but think you may have had me in mind when you wrote "and for ginger lovers only" knowing that I am not a big fan of ginger. That being said, it doesn't really matter what my favorites are knowing that everything you make is absolutely delicious! And now that I have posted this I am so excited to move to the dark side, at last :-).